This blue makes Silvia look very old. Sorry but I don't understand why ? Myriam; deepens her wrinkles with bad blue shadows and takes her good skin color away. Victoria and Daniel are in the U.S. on a private trip with their kids. They're not expected back soon, from what I understand the only engagement Victoria has scheduled is in March, but that could change. The Swedish court also announced that Daniel will be taking maternity leave when they return and will focus on staying home and taking care of the kids, while Victoria works so there won't be that many engagements for him in the next few months. Mrs. Merkel is a style-icon! I saw this news first on my old smartphone with a small screen. With that green jacket and the gold decoration in the background I mistook Ms Merkel for a christmastree. She sticks to her signature style - so much we can say. Someone had examined her style more closely and found that an overwhelming number of her jackets not only have the same cut but also feature three buttons. She has four here, which is quite the style departure from her usual, but ironically the four instead of three don´t help to close her jacket better; I cannot understand how one can place the buttons on a jacket so poorly, and how Frau Merkel didn´t see that the fit is totally off, or didn´t mind that it is. Her trousers not any better. To say something positive here, I´ll say that I like her necklaces, and I like that she doesn´t shy away from using colours. @ rainha l, Angela Merkel is a style icon? That must be a joke right? Coralie, where is our friend Diane Brown? PS.OMG as I heard your tyrant wants to be remembered one day as a KING. Diane, you are brave, don't ever qiut! 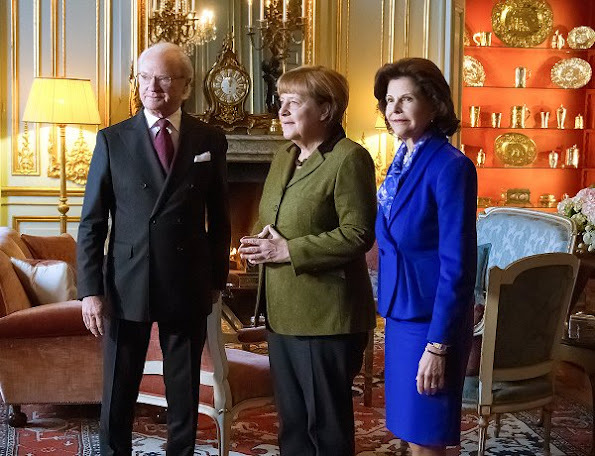 Queen Silvia should wear clothes in softer colors. Dark colors are not for people her age, the lighter shades of colors would make her look much younger. No comments about Angela Merkel. This seems to be a battle of ill-fitting suits [except for the king]! Ms Merkel's jacket, and the pants also, are so badly fitted. I understand that style isn't a priority for her - she has enough else to deal with - but surely she looks in a mirror now and then. I don't like the cut of the queen's jacket at all. The pleats[?] at the waist just make her look dumpy. It's not the blue, it is the scarf that gives it that "matronly" look. Dump the scarf in favor of a perky (solid color) paleblouse and it would serve it much better. Both ladies are not at their best here. At least the queen looks good sometimes, but Frau Merkel is a disaster! I like Angela Merkel jacket. i like the cut and the colour, the style is also very becoming to a fuller figured womam and suit her well. 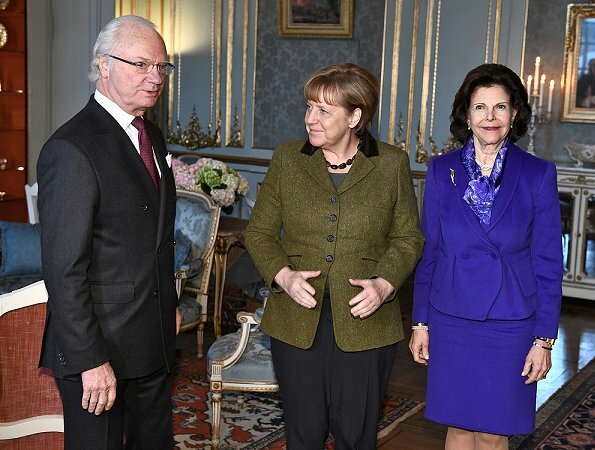 Queen Silvia's jacket on the other hand doesn't appear to fit well and in my opinion. The Queen in my opinion also needs to lighten her hair slightly, the almost black/brown is to stark against her skin. I wonder why Merkle always has her fingers making that pyramid sign? In every picture she poses for she has her fingers like that. Strange. I have heard that it is a symbol of the One World Order. Very strange indeed. Don't like the drab green color she has chosen for that jacket. The Queen looks regal as always.